Matthew 1:25 is the twenty-fifth and last verse of the first chapter of the Gospel of Matthew in the New Testament. 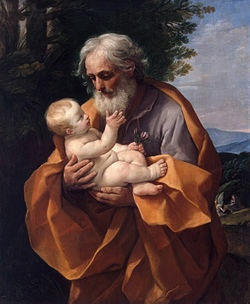 Joseph has awakened from a dream in which an angel gave him instructions about the birth of Jesus. He has taken Mary into his home, completing their marriage, and this verse explains what occurs once the couple is united. son and he called his name JESUS. firstborn son. He named him Jesus. This verse suggests that Mary was a virgin at the time of Jesus' birth, and is cited as one of the scriptural evidences for the Virgin Birth. Older and more puritanical[neutrality is disputed] translations, such as the King James Version, often bowdlerized this passage using more euphemistic terms. Modern versions almost all use the word sexual. Eugene Boring notes the extreme level of personal detail the author of the gospel seems to possess in verses like this. This passage is the centre of much controversy in the debate over the perpetual virginity of Mary. To many Protestants this verse is one of the central reasons for rejecting the Perpetual Virginity. The author of Matthew only states that sexual relations did not occur prior to the birth of Jesus, implying that they occurred afterwards. Those who support the Perpetual Virginity argue that the passage is far vaguer in the original Greek than it is in English. In English a negation until implies that the event in question did happen afterwards. Raymond E. Brown, a Roman Catholic, states that some scholars contend in Greek a negation until implies nothing about what happens afterwards. Presbyterian David Hill acknowledges that the wording does not absolutely deny the Perpetual Virginity; however, he argues that if the idea of the perpetual virginity had been current at the time the gospel was written then the author of Matthew would have been more specific. Boring notes that the command of the angel at Matthew 1:20 states nothing about avoiding sexual relations either before or after the birth of Jesus. 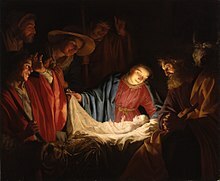 As reported in Luke the child would have been named eight days after his birth at the time of the circumcision. The phrase "he called" is gender neutral in the original Greek. Some translate the line as "she called," which is somewhat more in keeping with Luke, but which contradicts the rest of this chapter. Most scholars and translations thus have Joseph as the namer. Legally either parent could name the child. Robert H. Gundry believes that having Joseph naming Jesus is a clear demonstration of Jesus' legal status as his son, and thus as an heir of King David, a continuation of the argument made by the genealogy. ^ Brown, Raymond E. The Birth of the Messiah: A Commentary on the Infancy Narratives in Matthew and Luke. London: G. Chapman, 1977. ^ Gundry, Robert H. Matthew a Commentary on his Literary and Theological Art. Grand Rapids: William B. Eerdmans Publishing Company, 1982. This page was last edited on 2 April 2019, at 17:45 (UTC).